The lead pack was temporarily reduced to 10. However they slowed after 24km and two regained contact. Pacemakers dropped out at 30km to leave a group of six, five of whom eventually took the first five finishing positions, At 32km Tewelde Estifanios increased the pace and only Hiroki Kadota and Hiroyuki Yamamoto tried to stay with him. Yamamoto let go first, and then Kadota. In the men's race a close but even-paced race got the best out of two debutants, Kenya's Paul Kuria and New Zealander Zane Robertson, who were locked together for the entire race. Behind them four of the next six runners posted personal best times. The men's and women's races developed in complete contrast, with a relaxed group of 10 men passing through the first 5km in a leisurely 14:33 and holding together as they marginally increased the pace in the next 5km (14:23). The women, on the other hand started at a respectable pace with a group of five passing 5km only 70 seconds behind the lead men. Mary Keitany led, and increased the pace over the next 5km to pass 10km in 31:07 — on pace to break her own course record of 1:05.50 and with Mamitu Daska, Cynthia Limo and Josephine Chepkoech hanging on. All three went on to significantly improve their personal bests, but even as Keitany ran away from them the possibility of a course record was slipping away. 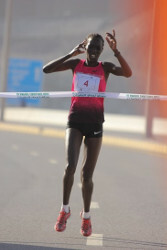 She eventually finished with the second fastest time over the RAK course and the third fastest ever run. After 15km in the men's race, still with a lead group of nine, a break was attempted which strung the field out but too many remained together to prevent the endgame being other than tactical conservation of energy for a final kick. 23-year old Mosinet Geremew proved fastest in the finishing straight as five men finished within nine seconds and for only the second time in the race's nine-year history none among them broke the hour. 469 men and 168 women tackled the twisting mountain highway on which this uphill and downhill challenge is run. There were 435 women and 284 men in the associated fun race, making a grand total of 1356 in both races from 24 different countries. This was up from 560 runners from 21 countries the year before. Florence Kiplagat improved on her own half-marathon mark set in the same race last year by three seconds writes Phil Minshull and John Mulkeen. She also set world records* for 15km and 20km en route. Kiplagat' benefited from almost perfect conditions in the Catalan capital, with slightly overcast skies and temperatures hovering about 10 degrees Celsius. Helped by male pacemakers Marc Roig and her compatriot Ezekiel Kipchirchir, she passed through 5km in 15:38 and 10km in 31:01, eight seconds up on her pace from last year. After covering the next 5km in 15:12, she passed 15km in 46:13, 15 seconds inside Tirunesh Dibaba's world record for the distance. 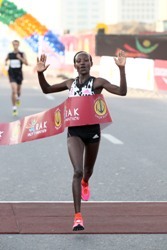 The final five kilometres took her 20 seconds longer than last year but she still passed through 20km in 1:01:53 which took three seconds off that world record as well, to finish 12th overall. Approximately 15,000 runners, more than 25% of which were women, took part in the race. 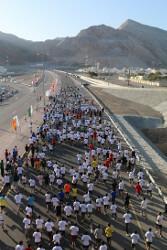 12000 men and 4000 women took part, including 1774 foreign runners representing 44 countries. Now in its eighth edition the race is more a festival of running than simply a marathon, offering a 5km; 10km, half marathon and full marathon which in all attract around 2500 runners writes Norrie Williamson. 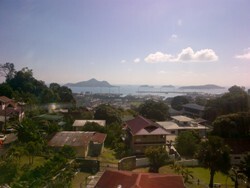 These numbers account for around 2.8% of the population, of the entire 116-island cluster that makes up the Seychelles. They are the world's oldest oceanic islands, uniquely made up of continental granite rocks. The marathon and half marathon make a considerable contribution to tourism and the local economy. All races start and finish in the hotel, beach and tourist hub of Beau Vallon, Although the routes hugs the coastal road around the northern peak of Mahe, they are anything but flat and frequently expose runners to direct sun. Even in the shade the lush tropical conditions mean contending with 80–90% humidity. 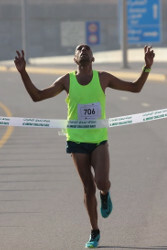 Conditions reduced the winner Shadrack Tanvi to a time over 20 minutes slower than his 2:16 personal best, yet the effects of the heat, humidity and hills is such that he is one of the few runners to have broken three hours in the event. But running here is not about times so much as the experience. Each corner and climb along the Indian Ocean coast exposes another golden sand beach with a backdrop of lush greenery, rocks and hills. Lapped with translucent blue waters and often protected by reefs, these are some of the world's most beautiful beaches. Lush green vegetation carpets the 905m peak of Mahe's Morne Seychellois. All races other than the marathon are straight out-and-back courses but the marathon wends its way around the northern point of Mahe, passing quaint houses, secluded hotels and local crafts shops including an exclusive perfume boutique to the capital city of Victoria. Over 20,000 of the population live in and around the city, which is where the original "Stone of Possession" was laid in 1756 when the islands were first declared a French colony. The first settlement was made in 1770 but Britain took over the islands in 1814 and in 1903 they became an independent crown colony, the same year that the clock tower was built in the city centre as memorial to Queen Victoria. 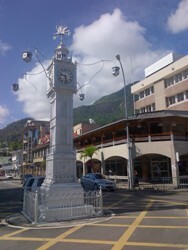 It is a replica of the clock at the junction of Vauxhall Bridge Road and Victoria Street in London. In 1976 the Seychelles became an independent republic. Russians are amongst the most prolific European tourists with the Gulf and Asia the other major contributors to the 20,000 plus that visit the islands each February. Tourism growth and the international airport have allowed the Marathon to grow each year and this small, uniquely beautiful event is set to bloom, offering runners both a challenging and an opportunity to relax in what has been described as the last paradise on earth. Endeshaw Negesse broke away from Kenya's defending champion Dickson Chumba just before 40km to become only the second Ethiopian man, after Hailu Mekonnen in 2011, to win Japan's most prestigious road race. It was third fastest time in Tokyo Marathon. Efficient pacing pulled lead runners through halfway in 1:03:08; it finished at 30km (1:29:50). There were no Japanese left in the lead group after 31km, although Masato Imai did regain contact with the leaders, only to fall back again. After 35km (1:44:44), only four runners were left together, and between 36–37km Shumi Dechasa and Olympic Champion Strephen Kiprotich fell back, making it into a duel between Chumba and Negesse. They passed 40km only two seconds slower than Chumba did last year on his way to the course record of 2:05:42 but Chumba now struggled with a stomach cramp and Negesse was not pushed. Kiprotich passed the fading Chumba in the final metres to finish second in a personal best of 2:06:33, an improvement of 47 seconds. The race to be first Japanese runner home, with 2015 IAAF World Championships places at stake, was won by Imai who ran a personal best by nearly two minutes. Birhane Dibaba beat Tirfi Tsegaye's 2:22:23 course record from a year ago. After passing 10km in 33:44 at 10km the pace slowed. Five runners: Dibaba, her compatriot and London 2012 Olympic Games champion Tiki Gelana as well as the Kenya trio of Helah Kiprop, Selly Kaptich Chepyego and Flomena Cheyech Daniel, passed halfway together in 1:11:41. They continued through 25km and 30km before Dibaba picked up the pace to win by 48 seconds. Kiprop stayed close to Dibaba until 35km and hung on to finish second, improving her personal best by more than three minutes, while Gelana finished third in 2:24:26: her fastest time, as well as highest finishing position, since her race at the Olympics. An estimated 36,000 runners took to the streets of the Japanese capital. A lead group of nine men reached halfway in 1:04:00, on schedule to beat the course record. After 25km Lawrence Cherono, running his debut marathon, increased his pace and only Chichir Kipchumba was able to keep up. By 30km he was on his own, but his pace slowed slightly as the day warmed up. Filomena Costa ran a conservative first half tucked in behind Abebech Tsegaye and Mercy Jelimo, but after a 1:14:04 first half Filomena Costa strode on ahead of her rivals after 28km to record a marginally negative split of 1:13:56, a personal best by three minutes and the second fastest ever women's performance in the race.